James Smith is mentioned in many secondary accounts as one of the earliest settlers at the mouth of the River Trent around 1790 and as such more needs to be known about the man and his role in the area. "In 1790, James Smith, a UEL, became a permanent settler, erecting a log house at the base of Bunker Hill, and in the same year John Bleecker, a son in law of Capt Meyers, a UEL who settled in Sydney, became another settler, and erected the first inn at the place which was designated to become the Trenton of the future. These appear to be the first real settlers of Port Trenton." Thanks to Peter Johnson and Frank Doherty for their assistance. This is a long web page - so use these links to navigate up and down the page. Petitions of other local "Smiths"
James Smith was a Judge of the Court of Common Pleas in Dutchess County, New York who took on the rebels and was tarred and feathered for his actions in 1775. During the revolutionary war he was a prisoner for three years and then was back with the British and had a warrant to form a regiment under Col Abraham Cuyler. Coming to Upper Canada in 1789 he petitioned for land and was granted 700 acres, receiving 200 in Sidney Township. With 500 acres still due to him, in 1793, he moved and made improvements to what he thought was vacant land on the eastern bank at the mouth of the Trent River. The surveyors had reserved this land and through a number of petitions and reports he finally was successful in getting possession of the land and in the process had his total grant enlarged to 1200 acres, "to put him on a footing with other Magistrates" in Upper Canada. He is last noted in the 1803 Murray Township census as a 71 year old man (thus born about 1732) probably living next to his son John. His will is dated 13 May 1803 and it was probated on 21 June 1805 so his death date is being rounded to 1804. He sold land in May and June in 1803 likely in an effort to settle his affairs. No records have been found that describe what type of business James conducted - merchant, potash, farming, lumbering are all possibilities. As a magistrate he would have received income from certifying oaths and sitting in on Quarter Sessions but no records have yet been found naming him in these activities. His eldest son James stayed in New York State but sons Peter I Smith, Henry and John Smith all came to Upper Canada. His youngest son John claimed in a petition that he had been operating a ferry service across the Trent since 1792. No daughters are named in his will so he either had none or they were married and may have already received a gift from James. James's wife is unknown and early records in Dutchess County or other parts of the north eastern US need to be researched to find out more about his American roots. It is possible that he had a brother Isaac Smith. A good place to start the story is with the report of James Smith being tarred and feathered in 1775. “New. York, September 27, 1775. Source: Diary of the American Revolution from newspapers and original documents, Frank Moore, vol. ii. New York, Charles Scribner, 1860, 138, (it quotes the above source and also Upcott, iv. 327), google books. The Upcott source has not been found. Regarding the above; the James N Smith may be a different man from the James Smith mentioned in the Committee records. In the section below on Commission of Conspiracy records it is speculated that the James Smith of Murray is the same man as the James Smith in the NY record. James made 5 lengthy petitions to the Executive Council in Upper Canada and they are transcribed in the petitions section below. They make interesting reading and demonstrate the workings of the Land Board. He states his case in the petitions and the Council usually requests a report from the Surveyor General. Sworn certificates are often included verifying the truthfulness of the critical parts of his story. Decisions were often slow to be made. The details of his years during the Revolutionary War are spread amongst the petitions and it matches well with the letter quoted above. In his first petition in 1789 he states that he was a "Judge of the Court of Common Pleas in the County of Dutchess" and due to the "exertions of an unruly Mob and Committees was most inhumanly abused and partly lost the use of his right hand" and "had been tarred & feathered in the basest manner they could effect and afterwards much harrassed in Gaol and on board the prisonships for the space of three years" and "after that term ... was sent within the British Lines." He then states that he received half a dollar a day pension until "his family was sent within the British Lines" when he received £37 per quarter for support. James declares that he was a Captain and was given a warrant to raise a regiment under Col Cuyler. There are a number of accounts of this in the petitions below and the clearest and likely most accurate one is in the deposition by Cuyler himself in petition 24. In this first petition he requested 2000 acres but only received 200 acres [lot 3, Con 2, Sidney Township] with the additional statement that the "Land Board directed to propose the balance to make up 700 acres in total." Curiously James was never added to the UE Loyalist lists maintained by the Council. Others who came after 1789 were added so his late arrival is not the main reason. Perhaps it is that he never actually raised his regiment that he was not added. His sons never petitioned for land as sons of a Loyalist. However James was given a generous grant so his support for the British cause was rewarded. At some point James returned to New York to settle some matters and he wrote that he had taken his land warrant for 700 acres with him and he had left it with his family. Further he states in petition 24 that, "My family expecting my papers to be examined by the Rebels as thay had done before thought if thay found my warrant I should sertinly be put to Death and they Destroyed it on that account." This was to explain why he no longer had his warrant in 1793 when he petitioned to claim his remaining land. In 1798 James states in petition 185 that he understood that he had "an additional 700 acres and to locate the same in any township then vacant" and that he "then settled on the east side of the River Trent in the township of Murray in the year 1793." In 1793 James explains in petition 151 how he "took Lotts No 1, 2, 3 & 4 and began my improvements on the second lott on the North [sic - actually the east] side of the River" and asks for this land to be granted. Council sends it to the surveyor and DW Smith, [no relation] Acting Surveyor General reports two years later in 1795. It needs to be explained that the Trent River flowed through Murray Township and both shores of the river were in Murray. Sidney Township stretched from Belleville all the way west to just a few hundred yards short of the Trent River up to the eastern boundary of Murray Township. DW Smith in his report explained that to grant Smith the land along the eastern shore of the river "would materially interfere with the regularity of the Township of Murray, and that Mr Smith, some years ago, rec’d official information from Mr Chewett, as well as from Mr Aitken that all the space between the west boundary of the Township of Sidney and the east bank of the River Trent on which he has settled has been reserved by Mr Collins in the year 1787 for works of defence, etc." Finally, six years later, in 1798 this matter gets resolved. On June 2, the Board declines the grant for the river bank land saying that "they do not consider themselves authorized under the ??? ???? to admit the petitioner to the portion of land he would have been entitled had he been commissioned as a Captain" but they do grant him 1200 acres to "put him on a footing with other magistrates." (see petition 24). However 5 days later things change in Smith's favour. On June 7 1798 James Smith petitions again (185) and on the very same day the Land Board issues this verdict. Ordered that the Surveyor General be authorized to include the lots on which the petitioners improvements are placed in his location of the lands still wanting to complete the 1200 acres Ordered notwithstanding they may fall within Mr Collins Reserve, and should the improvements incroach upon any lot intended to be reserved, the Surveyor general is directed not to place the reserve upon that lot. James Smith got his land! Why did he petition again on June 7 and get a same day response? Clearly the fix was in. We can imagine that he may have traveled to York, made his case and won support and was asked to petition again and he would get his land. In May 1800 Chewett & Ridout, surveyors issue a report and in June 1801 lots 1, 2, 3 in the 1st and 2nd concession of Murray lying between the eastern boundary line of the township and the River Trent. 649 acres, are granted to James Smith. In November of 1798, son Peter I Smith petitions on behalf of his father who is "an old man" for his 1200 acres and states that James Smith is living at Carrying Place, a few miles from the mouth of the Trent. Possibly he was living with his son John at that location. In petitions 110 and 144 in the years 1797 and 1800, son John Smith petitions as "the son the late James Smith Esq." The word late is crossed out in the 1800 petition. In 1803, James Smith, age 71 is listed in the 1803 Murray Census beside what is most probably his son John, age 31. Usually petitions were written by a clerk for the petitioner who could not write his own petition. John's petitions appear to be in a clerk's hand and it is very possible that the clerk thought James was deceased. In the second case the error was seen and crossed out. James is not in the 1804 or any later census so 1804 is taken as his probable year of death. This is consistent with his 1803 will that was probated in 1805. Did James Smith Esq cone from Stanford, Pine Plains, Dutchess Co., NY? In January 2016, Scott Smith came forward with information about a Judge James Smith, wife Dorus, a suspected Tory, his brother Isaac, sons James and Henry. Possibly the Judge is the same man that is the focus of this web page. The wife of James Smith who came to Upper Canada is not known in Canadian records. However in the will of James Smith of Upper Canada the sons James, Henry and youngest son John and grandchildren of his deceased son Peter; Silas, Dorcas, Esther, Phebe and Bathsheba, are all named. Henry's son Seymour of Sharon, Schoharie Co, NY; Joseph Carpenter, JP of Stanford NY who married Dorcas Smith and Bathsheba's daughter Rebecca Thomspon of Dutchess NY all come forward later to claim land in Upper Canada based on the will of James Smith. This is all an interesting fit to the Pine Plains information below. "SMITH, James ("Judge") and wife, Dorus, brother of Isaac Smith, Esquire, about 1760-65 lived on the Isaac Huntting homestead in North Stanford, and it is said built the original house there. See marriage of his two sons, James and Henry, in Peter Smith lineage. He was called a tory. SMITH, Isaac, Esquire, and Tammy Mead his wife came from Horse Neck, now Greenwich, Conn., about 1765 and it is said settled on the Sackett-Steger farm in the south part of the town. He deceased about 1821 and was buried in the cemetery, now almost unknown, east of Attleburry Corners, in the north part of Stanford. His wife was buried there also. Isaac SMITH, Esquire, and Tammy Mead had children. Tammy, Polly, Isaac, Reuben, Morris, William and Silas, who lived to an adult age. "SMITH, Peter, son of Benjamin SMITH, married Sarah Winans, a daughter of James Winans, the first settler of the Winans name in this vicinity. They came from Horse Neck about 1770. They had children, Peter, Anna, Sarah, Zady, Polly, Susan, Charlotte, James W., Daniel, Walter, Seymour and David. Anna married James Smith, son of Judge James above, a brother of Isaac Smith. Esq., above noticed. Charlotte married Henry Smith, son of Judge James above and brother to the husband of Anna: had five boys." It is reasonable to conclude that James Smith Esq of Murray is the same James Smith Esq named in the Commission of Conspiracy minutes from 1777 below. Committees of Safety evolved in Colonial America so that by 1775 they had become the operating government of rebel side of the Revolution. New York abolished all committees in favour of the "Commissioners of Conspiracies". Below are quotes from the minutes of the Commission for Conspiracies of NY involving James Smith Esq. There is no other James Smith in these extensive minutes. There is an excellent match between the minutes of the Commission for Conspiracies and the petitions of James Smith of Murray and this is the basis to conclude that they involve the same man. James Smith Esq, in a petition in Upper Canada, states that he was a Judge in the Court of Common Pleas in Dutchess County, and in 1775 due to the "exertions of an unruly Mob and Committees was most inhumanly abused and partly lost the use of his right hand" and "had been tarred & feathered in the basest manner they could effect and afterwards much harrassed in Gaol and on board the prisonships for the space of three years" and "after that term ... was sent within the British Lines." The Commission minutes below describe a James Smith Esq. The use of "Esq" is not insignificant as it denotes a man of some standing; a Judge for example. In 1777 he had been "removed to a neighbouring state for Notorious Disaffection". On Apr 29 1777, an order had been served for group of men to attend a meeting of the Board and that "some" felt it should be served to each individual and that James Smith demanded to see a copy of the order; an action that speaks to a demanding legal mind at work. Finally, 15 May, he is named in a list of men who are sent to prison ships at Esopus Creek. [Esopus Creek is a tributary of the west side of the Hudson River at Ulster County.] The next day, 16 May, he is given a 5 day parole to go home. Presumably he returned to the prison ship and after 3 years of being in jail and on the prison ship "was sent" to the British lines. Source: Minutes of the Committee and of the first Commission for detecting and defeating conspiracies in the state of New York, December 11, 1776 - September 23, 1778, with collateral documents : to which is added Minutes of the Council of appointment, state of New York, April 2, 1778 - May 3, 1779, New York Historical Society, Vol 1, 1924, available on Internet Archive, Thanks to Frank Doherty for stating that a James Smith was in this record. 21 April 1777 Commission for Conspiracies, Board met. Resolved that Col° Sutherland be requested to issue his orders to an officer of the Militia under his Command to cause the said James Smith to be apprehended and bro't before this Board forthwith and that this Board will defray the Expence thereof. 24 April 1777 Commission for Conspiracies, Board met. Lieut Jonas Parks appeared & informed the Board that he had apprehended & brought Prisoner James Smith Esqr. 29 April 1777 Commission for Conspiracies, Board met. Stephen Atwaters being duly sworn, Deposeth & Saith That on the day before the last Fast Day in March last there were at the Deponant's house, James Smith Esq, Simon Nueum, John Wilsey, & Jas Atwaters Esqr. That a Conversation arose about the Order of this Board requirin[g] the Attendance of persons comprehended in the Resolution of Convention of the 7th of March last. That some of the Company Imagined that there ought to be a special service of it on each Individual whereupon said James Atwaters said that it was to be distributed through the Country, and that the persons who were the Objects of it were bound to take notice of it. That James Smith Esqr expressed a great desire to see the Order, and desired the said James Atwaters Esqr to procure him one, that a printed Copy of the said Order, has been affixed up at the Deponant's house, during which Time the said James Smith has several Times been there but whether he ever read it or saw it, the Dept does not of his own knowledge know. The Dept farther saith that the said James Smith was in the hearing of the Dept told that Israel Lewis had the Order, whereupon the said James Smith requested of the said Simon Nueum that if he saw Israel Lewis, to desire him to send it to him. Isaac Smith being duly sworn, Deposeth & Saith That lately conversing with his Brother about the Order of this Board of the 10th of March last, his Brother said, that he had heard there was such a thing abroad which he understood ought to be served upon him and that he did not wish to see it, or words to that Effect. 15 May 1777, Commission for Conspiracies, Board met. 16 May 1777 Commission for Conspiracies, Board met. James Smith Esqr are permitted to go home on their parol, to deliver themselves in five Days from this Date, to the officer having the Charge & Custody of the prisoners at Esopus Creek. 25 Nov 1789, Alexander Chisholm, James Smith, Martin Fraleigh to receive 700 additional acres each. "And on the claims of James Smith, Martin Fraleigh & John Ferrier the Committee are led to consider them as meriting consideration from the remarks made on the petitions, by the Board at Mecklenburg as men of tried loyalty; they therefore humbly offer their opinion, that Alexander Chisholm, James Smith, Martin Fraleigh and John Ferrier may obtain or ??? the bounty granted by the board at Mecklenburg, an additional quantity to make in all 700 acres to each"
Land board directed to propose the balance to make up 700 acres in total. Humbly Sheweth that James Smith Esq has not long sonir? memoriald Your Excellency in Council for a grant of land on the River Trent for seven hundred acres of land, as followes, beginning at a certain stake standing on the north side of the said running forty chains Northwest as the River runs one hundred and seventy five chains, from there southwest till it strikes the said River always keeping forty chains from the River which will contain seven hundred acres with the usual allowance of land for highways in should be added, and Your Excellency memorialist as in duty bound will ever pray. On 24 Dec 1793 at Sidney, James Smith, having been in Upper Canada since 1789, petitions for 700 acres on the north [sic] side of the River Trent and which he previously took - lots 1, 2, 3 and 4 and improved lot 2. On 24 Apr 1795, DW Smith, act Surveyor General submits a report that states that James Smith's petition for 700 acres can’t be satisfied. It clarifies that the river runs north south and that James Smith has started to settle the east side. He writes that the lands "would materially interfere with the regularity of the Township of Murray, and that Mr Smith, some years ago, rec’d official information from Mr Chewett, as well as from Mr Aitken that all the space between the west boundary of the Township of Sidney and the east bank of the River Trent “on which he has settled “ has been reserved by Mr Collins in the year 1787 for works of defence, etc." Rec’d 24 May 1797, The patiuon James Smith Esq to Peter Russell Esq Acting Governor, that your patuonor had a warrant as Capn of Company of Foot in a Regiment or Coy Comanded by Abraham C Cuyler who had a warrant from Sir Henry Clinton as Liet Colo in the late American war to raise a batalion or Comy For the British forces by your petitioner. As soon as I came into the County of Dutchess whare the rest of my family was was from with a warrant by the Sherif and Committee to ??? for returning home contrary to my order of banishment which was during ?? and left any papors at home with my warrant. And I have drawn land on the same ??? Aug 21 1793, Kingston, Dear Sir, According to Promise, I have made all the Inquiry possible, respecting your lands; and, it appears that no memorandum of that business has been made by the Clerk of the Land Board. Therefore, I can only certify, personally, what I recollect of the affair. Which is, - That, on your arrival here, / the year I cannot specify / you applied for, and obtained a Grant from our Board for 200 acres of land. – Some time afterwards, at our Recommendation, you presented a memorial to L. Dorchester, in which your sufferings & services were particularly set forth; in Consequence of which, his Lordship was pleased to order that you should receive 700 acres of Land: - This order you produced to the Board; or it was communicated to them, in the minutes of the Govr & Council from Quebec: I do not precisely recollect which: Bit I know that such an order did exist – And I apprehend the reason that this does not appear in our minutes, is, that your Business, after the Govr granted the Prayer of your Petition, was with the surveyor, and not with the Land Board; especially, as the lands which you desired to locate, were not within the limits of our Jursidiction, being on the west or south side of the River Trent, - This is all that I remember of the business in Question; If it is of any service to you, I shall be very happy; and you have my Permission to make what up you pleae of my name, a sfar as the contents of this letter will authorize. Sepr 3 1790, Kingston, Dear Sir, I received your letter, and am sorry to hear of your distress: But, I hope, before this time, you may have found means to extricate yourself from your difficulties. – I sent a verbal message to you, in the latter part of the winter, by a Mr Isaac Vanderpool; which I find, has not reached you. I can now inform you, that the Board has received an answer to your memorial, and his Lordship has consented to allow you seven hundred acres of land – and, I need not add, that you will find no difficulty in obtaining Possession of it, as soon as you can appear here in person. 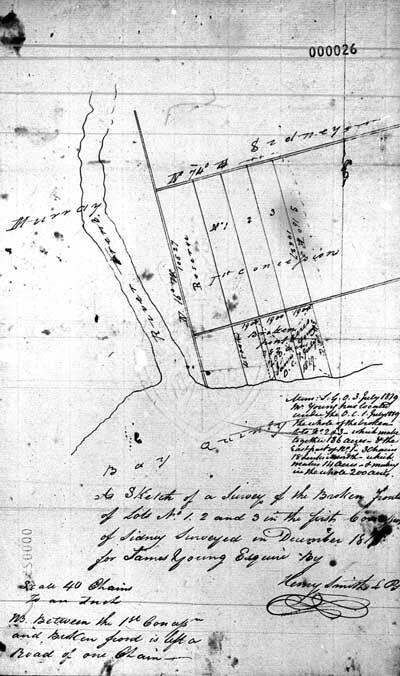 Rec’d 7 June 1798, James Smith, came into the province in 1789 and received a certificate of the Land Board at Kingston for 200 acres of land in Sidney Township. The Land Board then informed him that he must acquaint Lord Dorchester of his approach, his Lordship being acquainted with of your petitioners services and loyalty, ordered an additional 700 acres and to locate the same in any township then vacant in the province of Upper Canada. [fold] Read the same day. Ordered that the Surveyor General be authorized to include the petitioners improvements in his location of the lands still waiting to complete the 1200 acres ordered notwithstanding they may fall within MR Collins reserve and should the improvements incroach upon any intended to be reserved the surveyor general is directed not to place the Reserve on the lot. PR. 7 June 1798, James Smith Esq, Praying to be confirmed in the 700 acres ordered him by Lord Dorchester, and that an additional allowance may be assigned him, to put him on a footing with other Magistrates, and also to have the reserves taken of [off] his lots on which his improvements stand. James Smith is shown as having been granted lot 3, Con 2, Sidney and no other lot in Sidney. * 9 Sept 1800, Fiat of a grant of 659 acres being of the above to James Smith Esq. * Lot 2, Con 1: The abstract index for Murray shows James Smith being granted that part east of the Trent and Eliakim Weller being granted that part west of the Trent in June 1801 and May 1802 respectively. * Lot 1, Con A: 1 Mar 1801, patent to John Blacker for 17 acres. On 31 Dec 1821 John and George Blacker sell the land to Adam Henry Meyers. #17, 26 May 1803, James Smith, Esq, Murray sells 95 acres to John Row, miller, part lot 2, Con 2, Murray … witnessed by John Smith, William Cunningham and Henry Ripsom all of Murray. Note, In 1808 Henry Ripsom sells this land to Adam Henry Meyers including the mill that had been erected on the land. Source: East Northumberland County, Deeds, Murray Twp, Vol 1, AO, GS4768, #26? The last will and testament of James Smith, late of the Township of Murray in the County in Northumberland in the District of Newcastle and Province of Upper Canada, Esquire. In the name of God Amen. I James Smith ……. Being weak in body but of perfect mind and memory and knowing that it is appointed for all men once to die, do make and publish this my last will and Testament in manner and form following, First, I recommend my soul into the hands of God, that gave it me and my body to the Earth from whence it came not in, in the least doubling but I shall receive a Joyful Resurrection, and as to what Estate it hath pleased God to bestow me with, I dispose of as follows – I have already given to my youngest son John, Lot No one in the first concession of Murray, and one yoke of oxen, which is his full proportion. The remainder of my estate real and personal, I dispose of as follows – First I order, that my just debts and funeral charges be paid by my executors that is hereafter named, and the remainder to be divided in equal parts viz James, Henry, and the Heirs of my deceased son Silas, Dorcas, Easter [Esther], Phebe and Bathsheba or their heirs – and I do hereby appoint my son James Smith, junior, with my trusty friends Mathias Marsh and William White both of the Township of Sidney in Upper Canada, my executors, and for their trouble give each of them on Guinea a piece over and above all expenses and trouble – and I do hereby denounce, and declare all former wills to be void and this to be my last will and Testament. Given under my hand and seal this thirteenth day of May and in the year of our Lord one thousand eight hundred and three. The affirmation when before me at York this 21st day of June 1805. 5. CHILDREN and GRANDCHILDREN of James Smith Esq. This is just a quick overview of each child. See the more extensive records in each section below. James Smith Esq, wife unknown, from Dutchess Co, NY, likely has a brother Isaac, settles in Murray Twp. James Smith [junior] - He stays in New York state and in 1812 is described as a yeoman from the Township of Canojoharie, Montgomery County, NY and in 1835 he is a 'gentleman' living in Salina, Onondaga Township, Jefferson County, NY. Peter J Smith was a Lieut in the Kings American Regiment, came to Upper Canada and died about 1800. His children below are all named in his father's will. Some of his children have been found in other records - see below. Silas - He was possibly living as a 6 year old with his uncle John Smith in Murray Township 1803 and later as a farmer in Sidney Township. Likely Silas was a younger child of Peter. Esther - no further record has been found. Phebe - no further record has been found. Henry came to Upper Canada around 1794 wife his wife, daughter of George Elmes UE, and died before 1817. His son Seymour is identified in a land record. John, the youngest, comes to Upper Canada and marries Phebe Lake, daughther of Nicolas Lake UE and settles in Murray Township as a yeoman. Children Silas (1797), Polly (1799), Betsy (1809) and maybe Martha have been identified below. James Smith [junior] stays in New York state and is described as a yeoman from the Township of Canojoharie, Montgomery County, NY and in 1835 he is a 'gentleman' living in Salina, Onondaga Township, Jefferson County, NY. It appears that James, "eldest son and heir" bought out the one seventh shares of his brother John, nephew Seymour and nieces Bathsheba and Dorcas (see below) and then sold his entire holding to Henry Ripsom in 1835. #378, 16 March 1812, B&S, John Smith, Murray, yeoman, sells to James Smith, Township of Canajoharry [Canajoharie] County of Montgomery, State of New York, yeoman, 100 acres, part of lot 1 and 2, east side of the River Trent, Con 1, Murray, beginning on the bank of the Bay of Quinte, in the centre of lot 1, north to the concession line between the first and second concession then south then east till it “intercepts the River Trent, thence down the river as it runs to the place of beginning” … “except the reservation in the original grant from the crown”, witnessed by John R Bleecker and George Bleecker. Both yeoman, Murray, reg 24 June 1813. #866, 22 Feb 1820, B&S, Henry Ripsom, Murray, £25, sells to James Smith, all the right Title interest claims and demands the said Ripsom now holds by purchase of Seymour Smith the only heir of Henry Smith who was one of the the heirs by will to the estate of James Smith deceased … witnessed by John Smith and John R Bleecker, Murray, reg 3 Nov 1821. Peter J Smith identifies himself as a son of James Smith Esq of Murray in petition 58. Lieut Peter J Smith has a very distinctive signature and it may be that he is Peter I Smith but in comparing his handwriting in a few petitions it appears that his name is Peter J Smith. In petition 31 Lieut Peter J Smith declares in Feb 1796 that he was a "late Lieut in His Majestys Kings American Regiment of Foot [KAR] … was in the Province of Upper Canada for this three years and has made considerable improvements on lands which he has purchased in Sydney on the Bay of Quinty." In petition 213 he is asking for lot 11, Con 1 in Sidney and states that "I am erecting a sawmill near it". In 1797 Peter leads a group of inhabitants in and around Rawdon Tp, up the Trent, to petition about the need for a mill and he records that he has 2000 acres of land. In Nov 1799, his brother John petitions to be given the 2000 acres in Rawdon that were granted to his "deceased brother, Peter I Smith". On 7 April 1800 a small number of men petition about the fact that they "are creditors of the late Peter J Smith, Esq, deceased, to a large amount. In his lifetime he bargained away 2000 acres to James Frederick, a tranchent person, to build a sawmill and race." One wonders if some of the 2000 acres was part of the 1200 acres still owing to his father. Peter died between 6 Nov 1798 when he petitions and the 18 Nov 1799 petition of his brother John where Peter is stated as "deceased." His father James lists Peter's children as heirs of "my deceased son" in his 1805 will. That your petitioner’s father is an old man and is desirous to receive a Patent for the 1200 acres of land granted him & located – a great part of which is considerably improved. 7 Apr 1800, Kingston, petitioners are creditors of the late Peter J Smith, Esq, deceased, to a large amount. In his lifetime he bargained away 2000 acres to James Frederick, a tranchent person, to build a sawmill and race and James Frederick on his part has not the smallest degree filled. Asking him to finish mill or settle the matter fairly. Joseph Anderson, Peter VanAlstine, John Blacker, Asa Wallbridge, Nathan Curtis. SILAS - A man named Silas is living with John Smith in the 1803 Murray census and may be the younger son of Peter J Smith who came to Upper Canada with his father. Henry Smith came to Upper Canada in 1794 with his wife, the daughter of George Elmes, and 3 children and was granted 200 acres. George Elmes died during the War so would not be on the UE list and his children could not claim as children of a loyalist. His wife is named as Mary in 1807 and is presumably the same woman. A Henry R Smith received lot 21, Con 7, Sidney and this may be the same man. The land books for 1797 did not survive so finding what lot he received needs more work. In 1817 his son Seymour identifies himself as the only heir of Henry Smith, deceased suggesting the other children were deceased or not mentioned in Henry's will. No will has been found. Henry is re-elected Town Clerk for Sidney a number of times. See Sidney Minute Book. A Henry Smith, "surveyor, Sidney" is a very frequent witness to land deeds in the Hastings County Copybooks. Unless proven otherwise, it is assumed that this Henry is the same man as above. Henry is first named in 1802 and first as a surveyor in 1805. He is named 16 times in Book A from 1802 to 1811. He is last named as a witness on 22 Jun 1814 in Book C - see instrument 311. His wife is named as Mary Smith in 1807 as a witness in a land deed in Book B - see instrument 114. In 1817, Seymour Smith, son of Henry Smith deceased, sells his interest in the inheritance from James Smith Esq. 23 October 1797, Sidney, Henry Smith of Sidney, has been settled for three years past brought with him a wife and three children, his wife the daughter of George Elmes, who died in the British Service during the late War and have drawn no lands for himself nor family … prays for such quantity of land …. Recommended for 200 acres 13 Nov 1797, warrant same day. Source: Map of Sidney dated 1787. See the chart of the names. John Smith petitioned in 1792 that he recently was "admitted as a settler" and is granted 200 acres and on 10 May 1797 he petitions again and adds that during the revolutionary war, as soon as he was of age, he "joined the Kings American Rgt [KAR] as Volunteer." This is the same regiment as his brother Lieut Peter I Smith was in. On the very same day, Phebe Lake petitions for land as the daughter of loyalist Nicholas Lake and states that she is the wife of John Smith. There is another John Smith in the area at the time but the juxtaposition of these two petitions strongly suggests that this Phebe Lake married John Smith, son of James Smith Esq. Furthermore John Smith is listed in the 1803 Murray Census as 31 with wife Polly (24) and children Silas (6) and Polly (4) right beside James Smith, age 71. This record naming Polly as his wife is a fly in the ointment. However in the 1808 Murray census his wife is named as Phebe. One can tell that census records were written out in good copy after the numeration and mistaking Polly for Phebe is possible. Also, Phoebe is named as the wife of John Smith Murray, tailor, in an 1804 court case (see below). It is my conclusion that Phebe Lake is the wife of John Smith, son of James Smith Esq. If John was born in 1772 this makes him 11 years old at the end of the Rev War and this is very young but not unheard of for a boy to volunteer in a regiment at the end of the war, especially if your older brother is there to look after you. Peter Johnson of the UEL Assoc. reported that John was not listed in the KAR roll in 1781 with his older brother Lt Peter I Smith but he may have enrolled later in the war due to his young age. In 1802, in petition 53 John states that "for the last eight years [he] has assisted travellers over the mouth of the River Trent" and he asks to be granted a lease to operate a ferry service across the mouth of the Trent River. Alexander Chisholm JP writes a condemning character reference and John does not get the lease. He applies again in 1808 supplying a petition of support from a number of inhabitants but he still does not get the lease. John Smith is not named in the 1814 census and it is possible he returned to the US where most of his family resided. His brother Henry had also died and his son Seymor returned to the States. 7 March 1792, Kingston, Memorial of John Smith, son of Mr James Smith “whose character & Loyalty are unquestionable and lately admitted as a settler in this District wishes to settle here & improve a farm of his own” and prays for the usual allowance of land. [fold] 11 Dec 1817, York, I certify the Land Board certificate in the name of John Smith for lot 93 in 3rd Concession Ameliasburgh is not found in my office. Darcy Boulton, Atty Gen.
10 May 1797, Sydney, Humble petitioner Pheby Lake, now wife of John Smith, daughter of Nicholas Lake, lawelist [loyalist], now wife as is settarth? to the ligne [sic] subject of His Majesty Prays she may receive lands …. [fold] rec’d 26 Aug 1797, Phebe Smith formerly Phebe Lake, recommended for 200 acres, warrant 13 Nov 1797, the warrant ought to have gone to Phoebe Smith instead of Phoebe Lake, described 6197 to Phebe Lake. Note: Nicholas Lake is granted lot 36, Con 5, Sidney. See chart of Sidney Map. Rec'd 18 Nov 1799, the Petition of John Smith, Humbly Sheweth, That previous to his brothers death, Peter I Smith, late Lieut during the American War, Your petitioner advanced him several sums of money at different times, seventy two dollars, and boarded him seventeen months - that your petitioner never received any compensation in it, more than making over all his lands to Your Petitioner as per annexed Bill of Sale or Letter of Attorney - Prays that the Military lands granted to his deceased brother that the deed, may issue in his own name - & Your Petitioner as in duty bound will ever pray [signed ] John Smith. The pet[itione]r must give notice of the application to his Elder Brothers & call on them to state their objections to the prayer of the petitioner. Rec'd 20 May 1800, John Smith, son of late Judge James Smith, Esq, the Bay of Quinty, petitioner has a location for 200 acres in the Surveyor general's Office under the new regulations prays may be allowed to locate 100 acres of the said lands at the Carrying Place at the head of the Bay of Quinty, will settle and improve the same immediately. [fold] 26 may 1800, Referred to His Excellency. Rec'd 26 May 1800, John Smith petitions for a lease. He has obtained from his father south and east half of lot 3, 2nd Con, Murray, wished to build a mill on lot and wishes to lease the remainder of said lot. - deferred. See petition of Wm Fairfield Jr, GW Meyers and Matthias Marsh. 16 Dec 1802, York, John Smith, Murray, yeoman, petitions that for the last eight years has assisted travellers over the mouth of the River Trent and for the four last years he has been upon his own land adjoining the passage, but not having a legal right he has been at no great expense, prays that he be granted a lease of the ferry, he will engage to build a proper craft for the accommodation of travellers under such regulations as Your Excellency may ???. 25 Oct 1803, Council Chamber, The Board ... the petitioner cannot be recommended to have the within prayer complied with the Board concerning him unworthy of this or any other Favor from the Crown. Entered in Land Book 5, page 303. "Leonard Walden Meyers, Sydney, on 27 July 1804 did assault at Murray Twp, Northumberland District, Phoebe Smith, wife of John Smith, Murray, tailor" ... "with force and arms an assault did make and her, the said Phoebe Smith, then and there did beat wound and evil entreat and these to her other enormous things did to the great damage hurt her .."
On 17 May 1808, we whose names are hereunto assigned petition .. to consider John Smith, son of James Smith Esq, Loyalist, ... the said John Smith has been one of the first settlers in the Township of Murray on the River Trent for the space of twelve years has assisted travellers crossing over said River much to the benefit of the public - the said Smith has built two Scows for the conveniency of ferrying across the River Trent ... we pray therefore .. grant John Smith a lease of the ferry in preference to any other person. Note: there are 52 names of supporters on this petition. See the web page on the Trent River Bridge. It is very lucky to have early census data that names children and wives. The 1803, 06 and 08 Murray census give us a good idea about John Smith and Phebe Lake's children. Phebe is the daughter of Nicholas Lake. In 1803 John Smith with children Silas and Polly is listed beside his father, James Smith. In 1806 they again appear and at this time so does John Drummond Smith, age 50 with a large family. In 1808 we see they now have 7 members in the family, one more than in 1806. Also in 1808 John D[rummond] Smith is identified and a new John Smith shows up on the scene. A daughter Betsy is born in 1809. It is possible Silas is the son of his older brother Peter who died about 1797. "Parents: John Smith, Phebe Lake -- Child: Betsy -- Date born: 2 June 1809"
9 Sep 1797, Thurlow, William Smith of Sidney, one of the first to come into this province … wife and four children and since has five more and has not drawn land. William Smith - granted lot 16, Con 1, 2, Sidney. Jacob George Smith - granted lot 15, Con 1, 2, Sidney. Michael Smith - granted lot 20, Con 2, Sidney. Jacob Smith - granted lot 21, Con 2, Sidney. Jacob Smith - granted lot 18, Con 3, Sidney. Thomas Smith - granted lot 33, Con 6, Sidney. In addition to the above names, these are on this map but not on the list above. Note: This Peter Smith, merchant, Kingston makes a number of petitions and is not to be confused with Peter I Smith. He is involved in land speculation in Murray and Cramahe at a later date. Jacob Smith, aged 90 y 2 months, farmer in North Fredericksburgh, died 25 March 1879 and his son John Smith of the same place was the informant. Thomas Smith U.E.of Kingston Township. OC 14Aug1797. Mate in the Marine Department on the Lakes during the revolutionary war. Was granted in 1797, 500 acres of land; L33, C6 Sidney, L11, C7 Uxbridge and L50, C2 Camden. Lived 2nd concession Kingston Township. Married Jacoba ---. Known children: Samuel m. Mary Buck and Moses m. Hannah Buck. Refer his will of 1817 and H&D commission, MS657, reel 51, Item #2676. Showing the western boundary of Sidney and how the right hand bank of the river is in Murray Township. This is the land sought by James Smith. Dated 1814? This section is under consideration. In April 2012 Catherine Tozer found and sent me a link to the work of Linda Smith about a James Smith, Constable etc, Crum Elbow, Nine Partners. At this time we are examining things to see if the James Smith in these records is the same James Smith, the subject of this web page. Stay tuned.